Honestly I was too tired to write an update yesterday. I don’t know why I waited so long to write it but by the time I thought about it seriously all I wanted to do was sleep. It was only 9pm. It was a lazy Sunday for me anyway. After church I came home and ate the rest of the sweet potato chips I made the day before. Afterward I kicked back with a quart of lemon water and a book. Some time later in the afternoon I ran out for fruit so the boy will have something to snack on. He doesn’t return to school until Tuesday. Anyhoo, I just didn’t feel like juicing. I packed lunch after eating some dinner but decided to juice this morning. That was Day 6. I’m hanging in there. Day 7 – I didn’t want to get up this morning so…I didn’t take any juice to work. I did squeeze some lemon and lime in a jar along with a couple of scoops of MSM. My joints are a bit achy lately. Anyway, I filled the jar with filtered water when I got to work. Lucky for me my client provides fresh fruit for snacks. Today I ate a very sweet banana and a tangerine. At some point I even had some fresh air popped popcorn without butter but oh well. I intended to spice it up with some cayenne pepper but my phone rang just as she handed me the bag and I got distracted. I was back at my desk before I realized I’d forgotten the pepper. Oh well, I’ll try that again sometime in the future. The thing is if I had some juice I would not have gotten hungry enough to eat the popcorn. I am committed to this fast though. My attitude – the enemy of my spirit rose early today. I realized at 7am I was being tested and adjusted my attitude. But it wasn’t easy. I sort of stayed in my corner. For real. 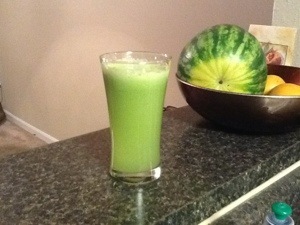 It’s made with apples, celery, cucumber, ginger, and lemon. It definitely had a kick to it. But I wouldn’t say it gave me energy. Sort of the opposite happened. I felt sort of dizzy or light headed. I can’t even think of what that could be from. On the plus side I’m almost totally hydrated. I have an appointment for my first colonic tomorrow. As long as I’m fully hydrated by next week I can begin taking the hot yoga classes I’ve been wanting to try. Looking forward to that and to this new year. There are tons of things I want to try. Most importantly I’m proud to have made it this far in the fast. Last year I attempted a juice feast and only made it to day 5. I don’t think I was as faithful during those 5 days as I should have been either. This time I’m determined. Spiritually I’m feeling a little more grounded.